Composting is a way of decomposing house and animal waste to create a fine, rich humus material that is applied as a soil amendment on the lawn or in the garden. Sheep manure is added to a compost pile to provide essential nitrogen, which feeds the microorganisms that decompose the organic material in the compost pile. Adding sheep manure in the correct manner when building the pile ensures the correct breakdown of the material and an effective compost pile. Locate an area that is free from heavy winds and direct sunlight for the location of your pile, suggests the University of Minnesota. Ensure the location has enough room for 5 cubic feet of material, and is not near any tree roots which may grow into the pile and leech moisture. Place a 3- to 4-inch pile of chopped brush on the compost pile location as a bedding to allow air circulation through the bottom of the pile, suggests Ohio State University. This keeps moisture from building up on the soil surface. Add a 6- to 8-inch layer of grass clippings, leaves and food scraps to the pile. Avoid excessive shredding of grass and leaves as this will cause the materials to compact and ruin the pile's porosity, says the Government of Alberta website. 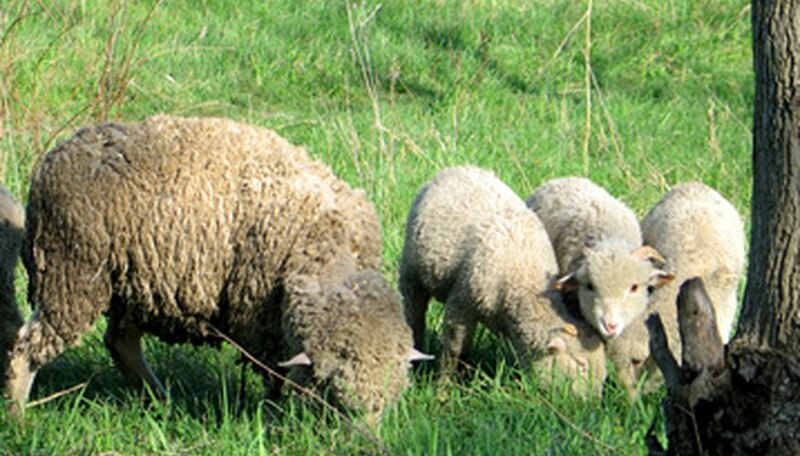 Spread a 1-inch layer of soil to add microorganisms to the pile, then add a 2- to 3-inch layer of sheep manure to the pile to provide nitrogen to the microorganisms added with the soil, says Ohio State University. Add water to the manure if it is dry. Repeat the layering steps to build your pile. An ideal pile should be 5 feet high, says the University of Minnesota, but Ohio State University warns that piles larger than 5 to 6 feet will slow the decomposition process. Moisten the pile once it is ready so that the material is spongy, but not soaked. Check the temperature of the pile after four to five days to ensure the decomposition process has begun. The temperature should stay around 131 degrees Fahrenheit to kill weed seeds and harmful pathogens in the pile, says the Government of Alberta. Turn the pile using a pitchfork after three to four weeks, adding water if the pile is dry. The compost pile is ready after two to three months.